Change Your Life. Ride A Bike! : Here We Go! Welcome! of children. Currently, great efforts are being made to provide bicycles for AIDS workers in Africa, tsunami survivors in Asia and underprivileged children in the U.S.
Those are big changes- a bicycle ambulance in Zimbabwe can be the difference between life and death. 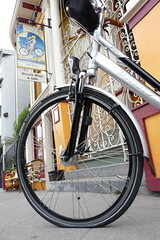 But bicycles can bring small changes to any life lived, anywhere in the world. Riding a bike makes us aware of the weather, demands that we pay attention to all our senses, requires co-operation with others on the road, challenges our understanding of our bodies and pushes our self imposed physical limits. 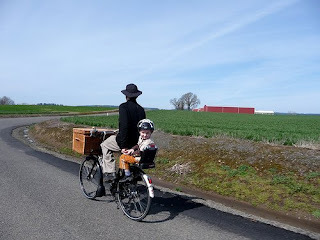 This blog is about these changes and how even small shifts in perspective that can come from bicycle riding can lead to big changes in how we see the world, how we live in it. Changes in our impact on the earth, or even just noticing how nice it is to have the wind in your hair. Sometimes, all it takes to have you change your career or go back to school or meet your neighbor for the first time, is a good bike ride! We look forward to sharing our stories, and even more, to hearing yours! 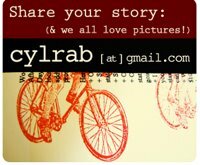 Please, please, please send us your bike of change and life stories! Why do you ride? Where has riding taken you? How do you tackle the challenges of where you live to keep riding? Did you meet your spouse on a bike? Did you use one to get away after sneaking out of the house at night? Share your adventure with the rest of us. Thanks! We look forward to hearing from you in the future! This is so great - Adrienne and meli together! How did I miss the entire first week of this new blog?? Adrienne, I'm so glad you now have a bike blog to call "home". I love reading your comments and guest posts all around the bike blog world and can't wait to see what you have in store for us here. The link is not up yet because Meli and I have been a bit crazy, lately (lets start a blog!). However, the above address will work. thanks everyone. we are very excited and happy to collab together in bringing stories and bicycles together, both locally and globally. I just stumbled on this blog, it's great. I am a 42 year old SAHM to a 17 month old son. I decided to quit my job to raise my son. What a wonderful decision I made. Now, my next big change is getting us out of the car. I hate it. I just put a deposit on an Azor-Oma today and look forward to having it in the next few weeks. I can't wait. Looking forward to seeing where bicycling takes us. I feel like a kid again. I look forward to watching and reading your blog. Melissa- We are happy you found us! We would love to see pictures! Maybe you could write us a little story about getting started with the bike (BTW, Love the Azor!!! You will, too!). I just found your blog and have been thoroughly enjoying it. We are trying to promote the fun part of riding here in Boulder, Co, as well. Boulder is a big biking town but more spandex than Dutch bikes. At any rate, thanks for the updates, photos and great info! Good to have you around, Jennifer! We look forward to seeing you around the blog! Please keep an eye out for my stolen bike it was stolen at 9:00 am on Valencia St between Clinton Park and 14 th in San Francisco. vintage campy group and brooks dk brown professional with copper rivets. Posted an ad on craigslist if anyone goes to a flea market please please let me know it is my transportation to work and I built it every component. Hey Ade and Mel, thanks for using my pic as your photo of the week, I'm highly honoured. Im so glad to have found your blog! I remember seeing your comments on Copenhagen Cycle Chic - and thinking what great insight you have! We are happy to have you here, Eva! The bicycle community is global which is such a fantastic thing. Cool site! Everyone can ride - and everyone should! Hope you like! Spread the word! I love your bike blog! I just started one about city cycling and cycling in Denver. I love this blog! I just moved to Amsterdam (originally from California) where the Dutch biking culture is HUGE. I'm intimidated by the number of bikes here (way more than people) but am learning to adapt to this wonderful mode of transportation. I wish there were more of it at home. Thanks for spreading the word! Wow! Very inspiring and informative (not in a boring way :-)) Thanks for doing it! 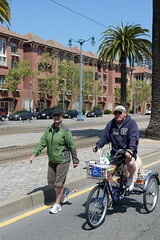 thank you all for such nice comments, it is the conversations and the multiple + various walks of life (rides of bikes!?) that keeps us going. Hi! I love your blog. It's really motivational for me to keep learning. Having never ridden a bike I became discouraged last summer when (at 23 years old) I kept falling off and freaking out about traffic. Although I still freak out sometimes, this blog just keeps me riding. Thanks! Yasmin- Glad to know we can help! If you are still feeling intimidated, find a group to ride with a few times through the places you are most frightened of. Being with a group, even just two other riders, can really boost your confidence and help you get past the fear! Thanks for reading us! I think this is great. Can I share this on my "how to change your life " blog? Your Space Or My Life? Oh, To Be Young, Again!